The Weekend Gourmet: Daily Buzz Food Taste Maker Outreach: Panera Bakery & Cafe Soup! Daily Buzz Food Taste Maker Outreach: Panera Bakery & Cafe Soup! thing I needed to warm up on a chilly afternoon! On a chilly day, there’s nothing I enjoy more than a warm bowl of soup. We finally received a proper cold front here in San Antonio over the weekend, so I was off in search of some soup to warm me up on a chilly afternoon! I had a gift card to enjoy some soup at Panera Bread courtesy of Daily Buzz Food's Taste Maker Outreach Program. I held onto the gift card…just waiting for soup weather to arrive. When it did, I hightailed it to my closest Panera Bakery & Cafe for lunch. Panera offers a wide range of hot soups every day, including classic flavors like French Onion and new favorites like Low-Fat Vegetarian Garden Vegetable with Pesto. All of their soups begin with fresh, thoughtfully sourced ingredients and their “Good Goes In” philosophy of making soup the right way. I love eating at Panera, and my standard You Pick 2 combo is a cup of their yummy Broccoli Cheddar soup paired with half of a Napa Almond Chicken Salad sandwich. This time, I took a slightly different approach and tried something new-to-me. My friendly server recommended I try the Vegetarian Creamy Tomato Soup coupled with the new Big Kid Grilled Cheese sandwich. That sounded like a winning combo, so I gave it a try…and I’m so glad I did. The tomato soup was warm and fresh-tasting…with chunks of tomatoes and just a touch of cream. It wasn’t too rich, but it wasn’t overly acidic either – it was a perfect balance. The portion size was nice as well…just enough to fill me up without being overly stuffed. Best of all, it came with some yummy croutons to sprinkle on top. The grilled cheese sandwich was majorly cheesy, with four kinds of cheese: gruyere, Vermont white cheddar, organic American, and Applewood smoked bacon. The best way to end a yummy lunch! Paired together, this soup and sandwich was a perfect lunchtime match. The portion size was just right for me...I was full, but not overly so. Once my croutons were gone from my soup, I got inventive. I dipped my sandwich into the soup with each bite. Amazing! Just for good measure, I added cookie to my order. Really…who can resist a fresh-baked cookie? 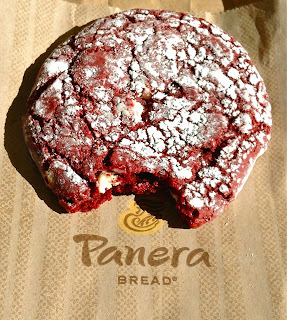 Especially when it’s a seasonal selection like this gorgeous Red Velvet Crinkle. This cookie was moist and chewy…and full of white chocolate chips. It was the perfect ending to my comforting lunch! The next time you get the urge for some comforting, delicious soup, pop into your local Panera Bakery & Cafe and give one of their soups a try. They rotate out flavors on a daily basis, so there’s likely to be something to catch your eye no matter when you drop in! To learn more about all the soups that are available at Panera Bread, visit their webpage. Disclosure: Daily Buzz Food sent me a Panera Bread gift card to facilitate this post. I am also receiving a stipend for this post. The pictures taken and opinions expressed are my own. I love that soup, especially with extra croutons!